Welcome back, my Cutting Edge Stencils friends. Looking to create that harmonious and balanced feeling you often find in a yoga studio? It’s easy! Our Mandalas Stencils are perfect for adding an exotic splash of pattern to any bare wall. Today we’re sharing how one yoga studio achieved a stylish splash of harmony by stenciling an accent wall using our Radiance Mandala Stencil from the Mandala Collection. We’d like to introduce Sophie Williams, a creative soul and decorative painter in Singapore. Sophie is also a huge Cutting Edge Stencils fan and recently shared pictures of her latest paint project for the Art of Yoga. It’s a boutique yoga studio where a person can find balance and harmony from the hectic hustle and bustle of Singapore’s fast paced life. Sounds amazing, right? Well that is why Sophie stepped in and helped make this the perfect sanctuary using one of our Mandala patterns. 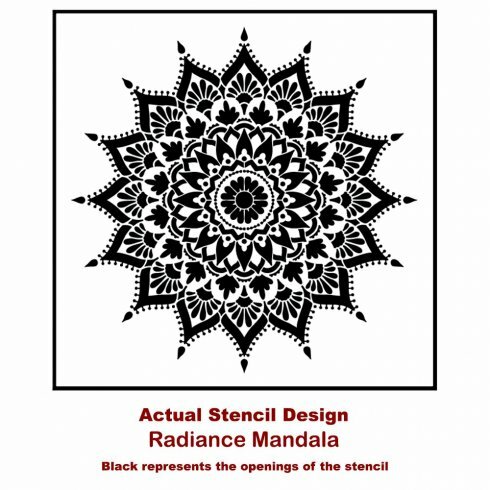 The first thing she did was browse our large collection of over-sized Mandala Stencils and select the Radiance Mandala Stencil. With the gorgeous Mandala stencil in hand she was ready to start stenciling! Sophie wanted to create the perfect backdrop for the Studio’s mascot, a gold frog. She chose the perfect wall and then sprayed the back of the stencil with spray adhesive. This helps hold the design in place and reduce bleeding. Sophie was using the 74″ quarter medallion for this project. Because this stencil is so big, it needs to be rotated four times to complete the entire pattern. For easy rotation, you can place a thumbtack in the center of the medallion. This will allow you to turn the pattern after each section was painted. Sophie painted the pretty pattern in metallic gold using a dense foam roller. She made sure she brushed off any excess paint on a piece of paper towel. Too much paint will cause the design to bleed. Sophie covered the entire design with paint before she rotated the pattern. When all four parts were finally painted, she peeled back the stencil to reveal the beautiful Radiance stencil pattern. Sophie didn’t stop there! Within the yoga studio is a small cafe where yogis can relax and enjoy tea. 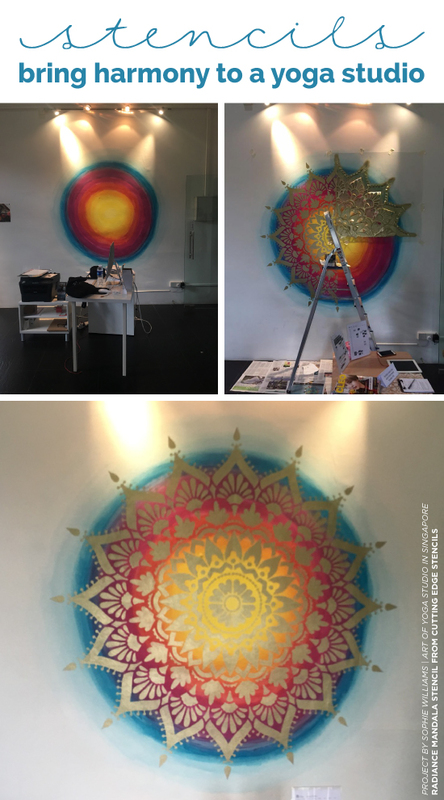 For this space, she wanted to create a beautiful sunset of colors behind the Mandala pattern. Sophie painted the rainbow colors in a circular pattern using Unicorn Spit. These vibrant gel stains acted as the beautiful backdrop for her stencils. Then she repeated the steps above to stencil the Radiance Pattern. Sophie left no space unstenciled! She even put the small freebie stencils that come with each purchase to good use. 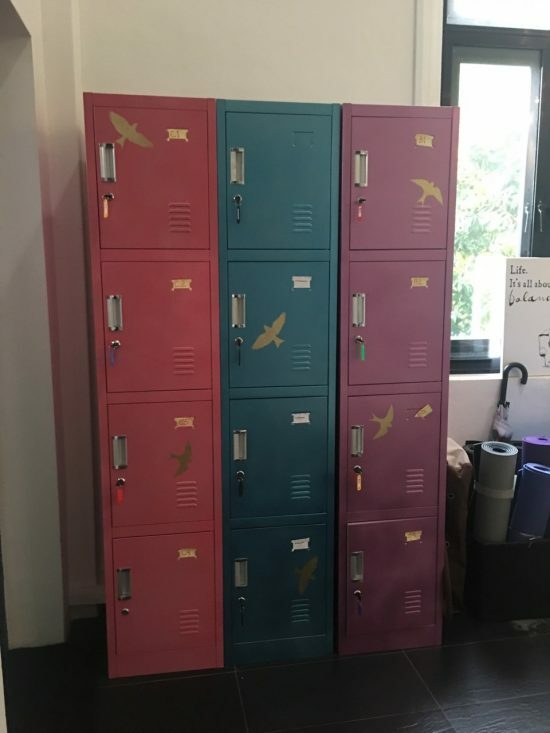 Sophie added charm to the yoga lockers using the small bird stencil and it looks adorable! If you love this project but you’re more of visual tutorial fan, then you’ll enjoy this quick video. See how Greg, one of the Cutting Edge Stencils owners and a creative DIYer, stenciled this pretty Mandala stencil on an accent wall. 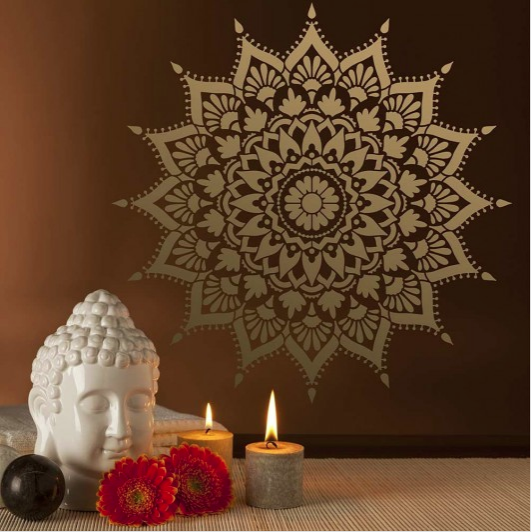 Tell us, would you stencil an over-sized Mandala pattern on your wall? Leave us a comment below, we’d love to read your thoughts!